The NFL’s most productive passing offense was up against the top passing defense as the San Diego Chargers hosted the Buffalo Bills in an AFC Divisional Playoff game on January 3, 1981. Under Head Coach Don Coryell, the Chargers were highly potent through the air as QB Dan Fouts (pictured at right) broke his own season passing yardage record with 4715 and an unprecedented three receivers gained over a thousand yards – WR John Jefferson (1340), TE Kellen Winslow (1290), and WR Charlie Joiner (1132). The addition of RB Chuck Muncie in a midseason trade with the Saints added an effective rushing element. While overshadowed by the offense, the defensive line was strong and led the league with 60 sacks. The Chargers topped the AFC West with an 11-5 record and, having been upset by the Oilers in the first round of the playoffs the previous year, were hungry to win. Buffalo under Chuck Knox, a defensive-minded coach formerly with the Rams, was back in the postseason for the first time since 1974 after winning the AFC East, also at 11-5. NT Fred Smerlas anchored a tough defensive line and inside linebackers Jim Haslett and Shane Nelson were solid. FS Bill Simpson, an ex-Ram, was inserted into the lineup when Jeff Nixon went down for the season with a knee injury with good results. QB Joe Ferguson directed a ground-oriented offense that benefited from the addition of rookie RB Joe Cribbs, who gained 1600 yards from scrimmage and was selected to the Pro Bowl. There were 52,253 fans in attendance for the Saturday afternoon contest at San Diego Jack Murphy Stadium. Buffalo’s Joe Ferguson reinjured his ankle five plays into the game, but after it was re-taped, he returned to action (it was only well afterward that it was discovered he had a hairline fracture). Meanwhile, backup QB Dan Manucci was under center for the remainder of Buffalo’s series, but the Bills failed to score when Nick Mike-Mayer’s 44-yard field goal attempt hit the left upright. San Diego also had injury problems in the early going, losing Gregg McCrary, their second tight end, and DE Charles DeJurnett for the remainder of the game. 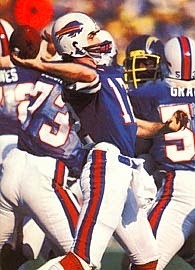 Still, the Chargers advanced to the Buffalo four and scored first on a 22-yard field goal by Rolf Benirschke. On Buffalo’s second series, which stretched into the early moments of the second quarter, the Bills responded by driving 72 yards to a one-yard touchdown carry by FB Roosevelt Leaks. Mike-Mayer added the extra point that put the visitors up by 7-3. San Diego had a chance to narrow the margin, but Benirschke was short on a 43-yard field goal attempt. With time running out in the first half, the Bills got a break on defense when CB Charles Romes forced Charlie Joiner to fumble and Bill Simpson recovered at the San Diego 33. Four plays later, Ferguson (pictured at left) passed to WR Frank Lewis for a TD with 16 seconds remaining on the clock. Mike-Mayer again converted and Buffalo took a 14-3 lead into the intermission. Facing a potential upset, San Diego had first possession in the second half and went 70 yards in just four plays. 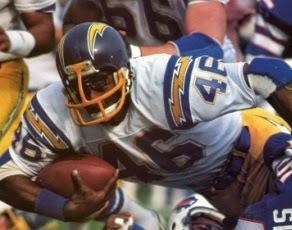 Chuck Muncie had an 18-yard carry and Fouts connected with Joiner for a 45-yard gain to the Buffalo eight. Fouts went to Joiner again for a nine-yard touchdown and, with Benirschke adding the PAT, Buffalo’s lead was cut to 14-10. The Bills had an opportunity to add to their lead, but an apparent 43-yard pass play from Ferguson to Lewis that would have put the ball on the San Diego 21 was nullified by a holding penalty. Later in the period, the Bills were pinned back at their eight yard line and had to punt, giving the Chargers the ball at the Buffalo 49. After advancing to the one, and as the game entered the final period, an illegal procedure penalty moved them back and they settled for a 22-yard Benirschke field goal. Down by a point, the Chargers again reached Buffalo territory but failed to score when WR Ron Smith couldn’t hold onto a pass that was picked off by Simpson at the Buffalo seven. The Bills had a chance to score after SS Mike Fuller fumbled on a punt return in his own territory, but, following two runs and a short pass, Mike-Mayer missed a 49-yard field goal with four minutes remaining in regulation. It did not look promising for the Chargers on their next series, especially when a second-down pass was nearly intercepted by Romes, who stepped in front of Jefferson but couldn’t hold onto the ball that bounced off of his chest. Facing a third-and-ten situation with 2:08 left on the clock, the Chargers lined up with five receivers. Fouts threw to Smith, who gathered the ball in at the 24 just ahead of Simpson and went the distance for a 50-yard touchdown. Benirschke added the extra point and San Diego was ahead by six points. There was still time remaining, but FS Glen Edwards intercepted a desperation pass by Ferguson, his second of the game, to seal the 20-14 win for the Chargers. San Diego had the lead in total yards (397 to 214) and first downs (21 to 17). The teams were essentially even in rushing yards (97 to 96 in favor of the Bills) but the Chargers were far ahead in net passing yards (301 to 147). San Diego recorded three sacks, at a cost of 33 yards, while Buffalo had two for 13 yards. Each team turned the ball over three times. 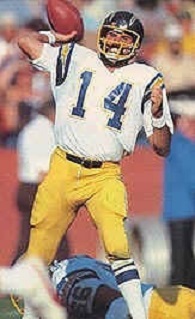 Dan Fouts completed 22 of 37 passes for 314 yards and two touchdowns, giving up one interception. Chuck Muncie (pictured below) rushed for 80 yards on 18 carries and had 6 catches for 53 more yards. John Jefferson had 7 pass receptions for 102 yards while Charlie Joiner added 83 yards on four catches that included a TD. Ron Smith caught only four passes during the regular season after being obtained from the Rams following the preseason. He had caught a long touchdown reception in LA’s upset of the Cowboys in the playoffs the previous year and his lone catch against Buffalo, following two drops, resulted in the game’s biggest play. For the Bills, the hobbled Joe Ferguson put on a gritty performance and was successful on 15 of 29 throws for 180 yards and a TD, although he was intercepted three times. Joe Cribbs was held to 53 yards on 18 rushing attempts and compiled another 36 yards on four receptions. TE Mark Brammer led the team with 62 yards on his four catches and Frank Lewis contributed three receptions for 45 yards and a score. “It’s one of the oldest plays in the book – throwing to the man who has the least amount of coverage,” explained Dan Fouts regarding the winning touchdown play. The Chargers faced the division-rival Oakland Raiders, who had qualified for the playoffs as a Wild Card, for the AFC Championship and lost a close contest. They won a third consecutive division title in 1981. Buffalo again reached the postseason, this time as a Wild Card, and was again eliminated at the Divisional level. Ron Smith was back with San Diego in 1981, but after catching three passes in nine games, he was released and picked up by the Philadelphia Eagles. He finished out the year with the Eagles and stayed with them during the strike-shortened ’82 season, when he had his most productive year in the NFL, catching 34 passes for 475 yards (14.0 avg.) and one touchdown. But the two most notable events in his career would be the playoff touchdowns for the Rams and Chargers.